Join us on April 27th and enjoy an exciting day of speakers, keynotes, breakouts, panel discussions and career development workshops. Discover your next career position and/or mentor at our Speed Recruiting and Speed Mentoring Sessions. Hear from the Who’s Who of London/UK Tech and discover how #LondonisOpen, and what we’re doing for women in tech, and to diversify our workforce in STEAM industries. After the conference, we’ll mix and mingle at the Buckingham Arms Pub and network with other industry pioneers and #changemakers in tech. 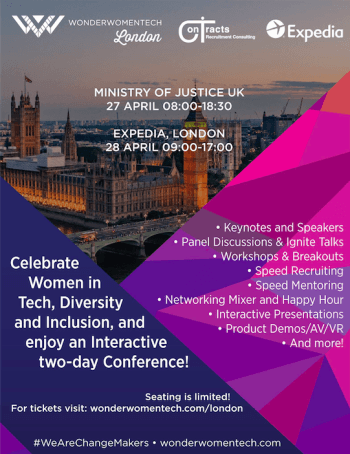 Join us on April 28th for our first Wonder Women Tech Interactive Conference where we will explore the worlds of Artificial Intelligence, AV/VR, product and app demos, mobility and travel, IoT, the intersection of arts+tech and much more! We’ll have a full day of speakers, keynotes, presentations, panels and fireside chats. Engage our partners and check out their stalls during our “Interactive Discovery” Sessions, and enjoy special art+tech performances during our networking Happy Hour post event! This is a special two-day tech conference you DON’T want to miss! Seating is limited so get your tickets early as we are sure to sell out!